Large displays solutions are used in places where a message has to be conveyed to large audiences. Typical applications would include scoreboard displays at sports stadiums, outdoor digital signage and large airport displays. These large, pixel-to-pixel displays usually employ LED (light-emitting diode) technology, with a LED for every pixel on the screen. They offer superior brightness and contrast while using comparatively little electricity. LCD-TFT screens are also popular for large displays. Questek Advanced Technologies can supply large screens for several applications, from esteemed manufacturers like Vutrix®. Vutrix® screens are manufactured of the highest quality materials and components available and benefit from their proven expertise in video processing circuit design to render the most responsive and accurate LCD screens available. These large display solutions are perfect for broadcasting applications, where very high picture quality is a prerequisite. Vutrix® engineers have developed technologies like de-interlacing, switching and scaling, resulting in image processing that offers artefact-free, accurate and sharp images. Each Vutrix® LCD panel is tested for colour response during manufacture and calibrated by an integral correction matrix across the entire visual spectrum. This process has been refined by Vutrix® over many years and ensures that every screen exhibits the correct colorimetry. There are user-adjustable controls for saturation levels, contrast and brightness too, to allow the operator to fine-tune the displays for a particular application. 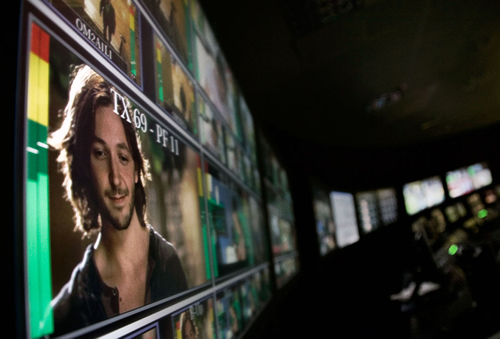 In addition, the user has control over black stretch, colour temperature and gamma settings too, and each panel’s colour channel can be separately set. These Vutrix® large display solutions represent the typical quality of the visualisation solutions provided by Questek Advanced Technologies. For more information, feel free to contact us today.